Measure out the 1/4 cup sugar and put into a small bowl. Put to one side. Combine warm water, yeast, salt, and 1 tsp of the set aside sugar in TM bowl. Mix 5 secs/speed 6. Add flour, oil and 2 tblsp of the set aside sugar. Mix 20 secs/speed 6. Set to closed lid, and knead for 2 mins on interval speed. Place into a lightly greased bowl, cover with plastic wrap and leave in a warm place for 1 hour or until doubled in size. Preheat oven to 220°C. Add the cinnamon to the remaining set aside sugar. Punch dough down. You shouldn’t need to knead, just press into a greased 30cm x 20cm baking tin. Cover with plastic wrap and leave in a warm place for 30 minutes. 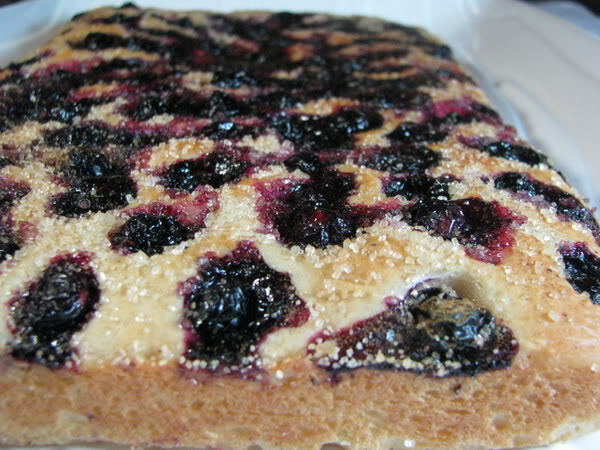 Dimple surface, then add blueberries evenly over the surface. Sprinkle the raw sugar evenly over the top. Bake 15 – 20 minutes. When you remove from the oven, spray with a little light olive oil and sprinkle with the cinnamon sugar. Cut into squares and serve with custard, but is nice just on it’s own.